Highland Restoration of Dufferin County, Peel/Caledon & Wellington Region has been serving the areas of Mount Forest, Shelburne, Dundalk, Alliston, Palgrave, Bolton, Caledon, Caledon East, Brampton, Arthur, Grand Valley, Erin, Acton, Guelph and Orangeville with professional cleaning and insurance restoration services for over 20 years. Some of our services include: Emergency Water Extraction & Dehumidification , Board-ups, Smoke & Odour Removal, On-Location Restoration, Pack Out & Delivery, Mold Remediation, Trauma Clean-up, Wood Restoration and Corrosion Control. Our services are complete with Air Duct Cleaning, Carpet & Furniture Reconditioning & Laundering. We also provide you with a complete and easy to follow estimate within 24 hours of your call. All estimates are done on Xactimate. Highland Restoration is fully equipped with a Truck Mounted Carpet & Furniture Cleaning Unit excellent for water extraction, a Truck Mounted Unit for Duct Cleaning, a Portable Dry Cleaning and Ceiling cleaning machine, a large selection of Dehumidifiers and Blowers and an Injection Wall Drying System to handle any size water damage claim. We have added two Ultrasonic Cleaning Units to complete content cleaning faster and with better results. Our Air Purifying Units assist with fire, sewage, and mold remediation jobs. In our 12,000 sq foot facility we are able to handle any size pack-out from cleaning to on-site heated storage. Highland Restoration aspires to be a leader in providing value-added cleaning and restoration services to our customers. 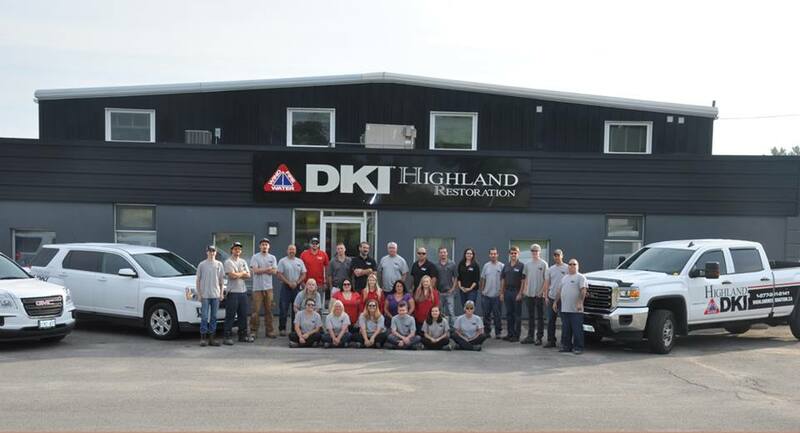 The Highland Restoration team excels at establishing lasting relationships with our customers by meeting their needs and exceeding their expectations through the highest quality of workmanship and service. Highland Restoration creates successful partnerships in the restoration industry. Highland Restoration achieves leadership in the restoration industry by seeking the most current and proven equipment, products and technologies. Highland Restoration supports its team of successful employees by providing training opportunities for technical certification in restoration and cleaning.